Wanting to change things up a bit this Father’s Day with something that Dad REALLY wants? We put together this list of some popular Dad offers from our Market Traders to help you out, although it’s hard to stop here. All Dad’s like to spruce up every now and then! Why not treat him to a hair-cut or beard trim at our popular barber Fade Spot. Or maybe the popular hot towel shave if your dad is ready to go beard-less again – the closest shave you’ll ever have they tell us! If you’re looking for some quality time with Dad without spending time in the kitchen, why not gift him lunch. A trip to the Market on the weekend and you can all soak up that fantastic Market vibe, with live music in Market Square, entertainment for the kids and locals going about their weekly shop. Give him a Prahran Market Voucher and then Dad can just pick and choose his favourite eats for the day – from a tasty Korean from Seoul Salon, fresh mussels from the Mussel Pot, a snag from Mr Bratwurst, handmade empanadas from El Alamo, or a bowl of wonton soup and a beer from Café Egnaro. Or why not graze across a few of each! Then there is the luxe experience with breakfast or lunch any Market day at Wilson & Market – sit and soak up the Market setting while enjoying one of Melbourne’s best dining experiences. Of course you could always just grab and go from your favourite providores at the Market for a delicious park picnic. Visit any of our delis for a tasty selection of meats and cheeses, or pick up some delicious pre-prepared salads and meals from speciality traders. The awesome pies quiches and sausage rolls at Barossa Fine Foods have been catching our eye lately, along with their house-cured Lachshinken and other German-style sausage and meats. Let’s face it, dads like to be the king of the BBQ! Essential Ingredient has the perfect cooking class – ‘Fire and Smoke’ with Daniel Wilson of Huxtaburger. Dad can explore the original cooking method preparing charred wagyu tataki with wild mushrooms, black garlic and ponzu, charcoal roasted chicken, tea smoked duck breast with soba noodles and yakitori cooked over a hibachi and even a charred Caesar salad. Or if dad likes to get back to basics, visit Hagen’s Organic Meats and get him a ticket for one of their butchery classes. He can learn about all the primal cuts and the different uses for each. But you’ll have to be quick, tickets are selling out fast. What about a new reusable water bottle or coffee cup, perhaps a spare for the car or the bike. 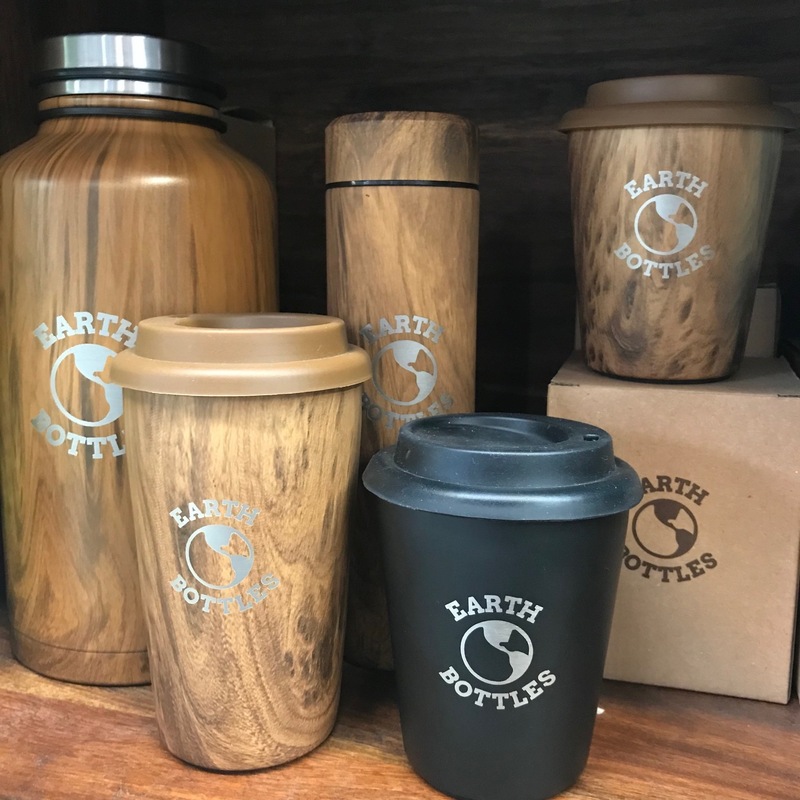 We love the timber-look Earth Bottles range at Shop Neutral although there’s a wide range of colours and designs to choose from, and you can grab all sorts of eco-friendly products to go with it, from composting units to reusable straws and bags for your veggies. There are loads of dads out there who harbour an inner foodie so why not treat it with a special meal or buy them some awesome produce they can play with at home. Lately, we’ve been eyeing off the beautiful steaks on offer from our butchers in Bracher Arcade including grass-fed, organic or dry aged, or game meats like rabbit, venison or wild boar. We’re finding it hard to go past the 1kg+ Tomahawk cut for a super-special meal for two. For dads that don’t eat red meat, there are beautiful seafood options aplenty, perhaps some fresh Pacific Oysters, local Victorian whiting or snapper. 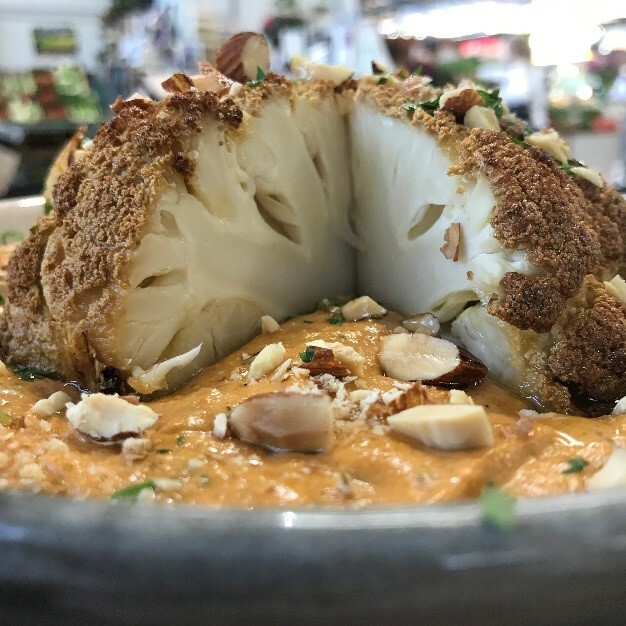 And vegetarian dads will love this recipe by Tobie Puttock for Whole Baked Cauliflower in Romesco Sauce made from some fresh and great tasting Cauliflower from one of our fruit and vegetable traders in Harvest Hall. Or grab a foodie gift for later, like the fantastic Father’s Day packs from many of our traders and even our Artisan Pop Ups with Agri. offering Fermented Sriracha, Beer Pickle, Negroni jam and Chocolate, and L’Artisan offering hampers with handmade pates and terrines. … and lastly, pair it with a tipple! Cap off his Fathers day with a tasty drop from the selection on offer from the Sommelier at Wilson and Market– including a great selection of wine and boutique beers. Or maybe gin is his thing – choose from an exciting range of bespoke gins from Australia and around the world. And don’t forget the card… Libertea has beautiful handmade cards that are little works of art, a real keeper. So there you have it: now you’ve got no excuses to miss Father’s Day this year and look at that, we’ve given you a chance to pick yourself up something tasty too.